A few years ago, I did a skills swap with a branding consultant who needed help with her novel. Through a series of searching questionnaires, she magically uncovered a common thread I had not seen before that ran through my many and various books and publications: fiction, non-fiction, self-help, trade and educational, children's and adults', poems and articles - they were all driven by a strong desire to help. As soon as I saw that, I knew where it had come from. When I was in my early twenties, my older sister killed herself, and the fact is I simply cannot bear to think of people feeling, as she must have done, that their life has no value or meaning, or that the joy of living is not enough to balance out the pain. In one way or another, most of my books seek to celebrate the joy and suggest robust ways of engaging with the struggle, through identifying what feels meaningful to you and actively pursuing it. Lately, I've been writing about writing, because for me that is the royal road to finding what feels meaningful and uncovering stories and images that can light a life. My first book for writers, Writing in the House of Dreams: Unlock the Power of Your Unconscious Mind, was about how to relax the conscious mind and open up to inspiration. My second, Happy Writing: Beat Your Blocks, Be Published and Find Your Flow, was for writers who, in the course of a long book or a career, may have begun to lose the pleasure of writing, because in the current publishing world it can be difficult not to abandon your unique inner necessities. 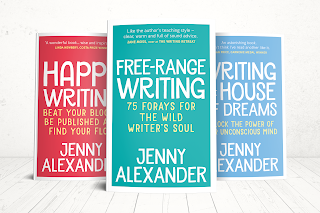 This new book, Free-Range Writing: 75 Forays For the Wild Writer's Soul, is about spreading your wings, inhabiting more of your writer self and building your writing confidence and power. A journalist who interviewed me for the local paper a few weeks ago asked me if I wasn’t doing myself out of business as a writing teacher, publishing a book that not only includes 75 writing tasks I might use in my workshops but also a chapter on how to use them to set up your own writing group. I explained that I didn’t see writing as a competitive thing like business, but as a way to build community. It was something that could enrich a person’s life, and writing in a group could satisfy a fundamental human need to share the stories of both our lived and imagined experiences, like elders under the tribal tree. As we were talking, I realised the reason why I teach writing is the same as the reason why I write. I want as many people as possible to know how to reach into the well and draw up what they need to sustain them through the vicissitudes of life. I don't want anyone to feel adrift on a sea of pointlessness and pain, because I know what can happen if they drift too far. I love my three writing books; I'm proud of them. So it's no hardship for me to be working on promotions. 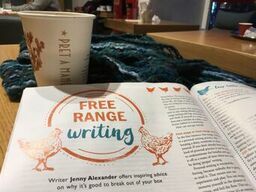 I've got an article about free-range writing in the current edition of Writing Magazine, and I've pitched to all the other major mags for writers. 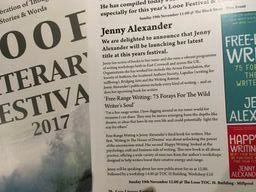 I'm organising events for a free-range writing tour, offering free talks and workshops for libraries, writing groups and bookshops, and I've got two slots at my local litfest in Looe on November 19th. All this isn't just about celebrating the new book; it's about celebrating writing. The way I see it, writing can help us reconnect with our deepest self and with other people, and that can keep us safe from despair. That's why I do it, and why I teach creative workshops. But we're all different, so how about you? Do you know what are you writing for? I understand your motivation for writing as mine is similar.For me childhood and adolescent experiences that left me feeling our family was "different" and that there is too much sadness, loneliness, unfairness and prejudice in the world. 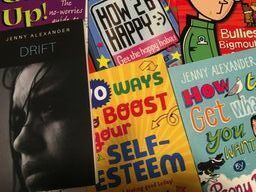 It drove me to "helping" or "rescuing" types of careers/jobs - and the same need to help or rescue or show people (especially children) that they have an inner strength and how to find it motivates my writing too. I think I write in the hope of re-creating for others the intense pleasure and solace I gained from reading stories as a child. Thanks for this interesting post, Jenny. I bought Writing Magazine yesterday but hadn't opened it yet, so I just went and found your article and will look forward to reading it later! Hello Hilary and Ann - thank you for commenting. Your two comments put into sharp focus for me how I felt when this unifying thread in my writing was first revealed to me. I didn't want to be a rescuer! I wanted to be an author who wrote for the pure pleasure, and purely to give pleasure to my readers. But it's been incredibly helpful for me to notice and acknowledge the kind of writer I actually am - the kind of person I am, too. A lot of people who come to my workshops say I'm an 'enabler' - I can hear it now, and not dismiss it - and I find, surprisingly, that that's all right by me. Absolutely agree that a writing group can be about much more than writing. It’s good for the soul, and it enables people to talk about what matters to them - and to laugh, too! Good for the soul - yes absolutely that! And always laughter too. Hi Steve - I'm so glad you enjoyed Writing in the House of Dreams - thank-you for telling me. Your comment reminded me of something I read: ‘Sometimes it’s said that art follows life but I’ve found the opposite to be true. Where else but in imagination do the first stirrings of desire form a tentative plan of action, for what might, much later, become one’s autobiography? In writing, we’re dealing with the prequels of decision when the forms of our transformation have not yet solidified into fact, when there’s still time to play with possibilities. Small variations here can make all the difference later on. Be careful what you write, because you may have to live it’ ~ Gwynneth Lewis. You definitely find this with dreams too - that weird feeling of deja vu when waking life seems to echo a previous dream, rather than our normal assumption, that it's the other way round. Fascinating, isn't it?! A lovely post and very interesting discussion. Having embarked on fiction writing seriously just over 10 years ago, the community I've found along the way is certainly one of the things I now treasure most. Wither my words, I don't know, but your PoV is true food for thought. Thank you. Jen, I did send you a fulsome e mail about how much the book meant to us at the time so I'm sorry if you didn't get it. But I love that Gwynneth Lewis quote - (one of Rosie's favouite poets as well. Perhaps it's because me own dreams are so boring that it's left to my imagination to fuel the future. Thank you for commenting, Rowena - writing really is a wonderful community. Steve - I've checked and I don't seem to have received your email - what a shame. I think dreams and writing are all part of the same process - it's imagination, and fantastic fuel for living! Jen, Steve - coming late to this but yes, I have certainly found that my writing 'foretells' my life. As do my dreams, sometimes, albeit in rather small, inconsequential ways. In fact, my writing has 'foretold' the future in much more significant ways - though, as Jenny says, that's probably because there are 'tentative plans' being made in the writing even though I was unconscious of it. Hi Sue - I've definitely written stories that have turned out to foreshadow major events in my life, although at the time I didn't anticipate them. Another quote: 'What is now real was once imagined' - that's Albert Einstein, maestro of the imagination! Thank you, Lydia! I hope you'll enjoy it.